Having worked in areas of activity that make capturing e-mails more difficult, or requiring greater alertness to succeed, I have had to deal with these difficulties that forced me to find solutions. Trial and error? Been there done that! Here is the summary of a much more detailed article published on my blog recently on the 21 tips that I used (and that I always use besides) to solve this problem of lack of subscribers on my list of emails. 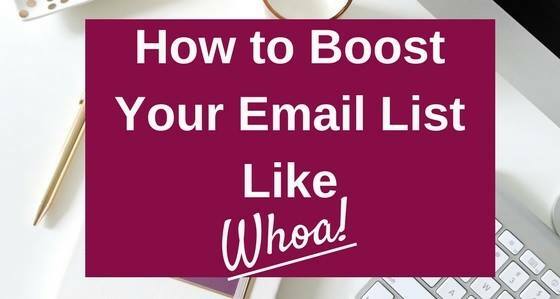 Knowing what to do with your list will facilitate the actions you will take as your e-mail list develops. Submit an attractive, relevant offer related to your industry to collect email from your visitors. Let them see what they will get when they subscribe to your list. A multitude of choices of platforms exists (Mailchimp, Aweber, Convert it, Infusionsoft, GetResponse, or others). But be careful not to find yourself in the spam of your subscribers by simply using your mailbox to achieve your ends, this is not your goal! This is your first contact with your audience. Make a good impression! Without being too long, you must introduce yourself, value yourself. Present possibly your best texts, projects, achievements, testimonials. Why not a trick and above all, do not forget to give him a way to contact you! Sign up for the email list of your competitors to study their marketing strategy. Take into account your differences and personalize according to your values, your mission, and your corporate vision so that the actions that will result from this competitive study are authentic. Save time and impress your new audience so they want to open each of your emails. The idea is to build trust and engage with it. To analyze conversions from one page to another, enter what best fits the action you want to measure in Google Analytics. You can have up to 20 different goals on your site. On the full article, the process of setting the goal is explained in detail. Make it extremely easy for people to sign up for your email list. There are tools like Thrive Leads or Lead Pages that allow you to use a dozen different tools to capture emails on your website. Summarize the essentials in just a few hundred words and make a PDF available for download. People often prefer concise versions or resumes to remember well what content they have consumed. This page should have no distractions, no menu. There must be only the essential: title, subtitle, benefits to register, form, call to action. The goal is to get the email from your visitor. You can use Thrive Themes Landing pages to make your landing pages. This is the page that your WordPress platform automatically displays when someone arrives on a page that does not exist or more on your site. Transform it and use it as an opportunity to build your list. Remove categories from your sidebar for new blogs, remove the ad, remove unnecessary widgets, give them fewer options. Add the "Share" button on your pages and articles as well as the "ClickToTweet". Put a link in your profile and immediately direct visitors to your subscriptions page to your list. Personally, I use a " First Visit" page so that people can know a little more about me before consuming my content. Send a personalized message to people who send you a contact request through social networks, and direct them to an offer that will automatically put them on your list of emails. The longer people stay on your blog, the more likely they are to subscribe to your list. If you use "Thrive Themes", you will be able to include at the foot of each article other articles that speak of a similar subject. Your "About" page is one of the most visited pages on your site. Take the opportunity to add a registration form! Get more views on your site without necessarily having to constantly redo new content. Re-publish your articles on sites that allow you to do so (Huffington post, Medium, Linkedin Pulse) without forgetting to redirect people to your site. Save valuable time with the Co-Schedule tool. If you want more details on any of these tactics, do not hesitate to consult me, if you are a blogger, Business Owner, or a Serial Entrepreneur, which gives more information on each of them or to ask me questions directly in the comments below. I will be happy to read the results you will get by putting these tactics into practice. If you sometimes use a technique that is not part of the list, feel free to share it with us in the comments. I'm always curious to try new things to improve myself.